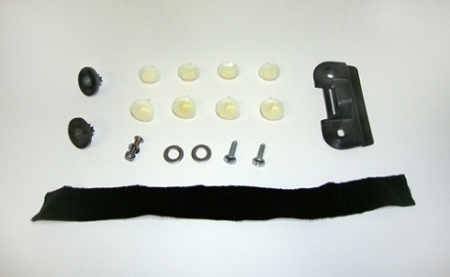 The kit is designed to work on all 1978-1987 G-body two-door cars. The difference is you have to use all 3 of your existing metal brackets and re-glue the new original GM window felt material (included in the kit) to them. Kit is complete with all the parts you would need to eliminate rattle problems in the door, along with easy-to-follow directions. By making just a few minor modifications such as using screws in place of rivets, making it user friendly. Installation of these items does require some mechanical ability, since you will have to remove the window completely from the door. We recommend however, that this kit be installed by someone familiar with the inner workings of door windows. Keep in mind, we are still depending on GM as a supplier for the one main part in this kit. Since the cars are now over 20 years old, we have no idea how long GM will still offer this one critical part that is needed in this kit. With that in mind, we recommend you purchase one or two kits to have on hand for when you plan to have this project done in the future. Each kit will do one door. If both of the doors need adjustments, you will need TWO kits. NOTE - We highly recommend purchasing 1 or 2 kits to have on hand, whether you plan to use them right away or at a later date, since some parts may become discontinued.